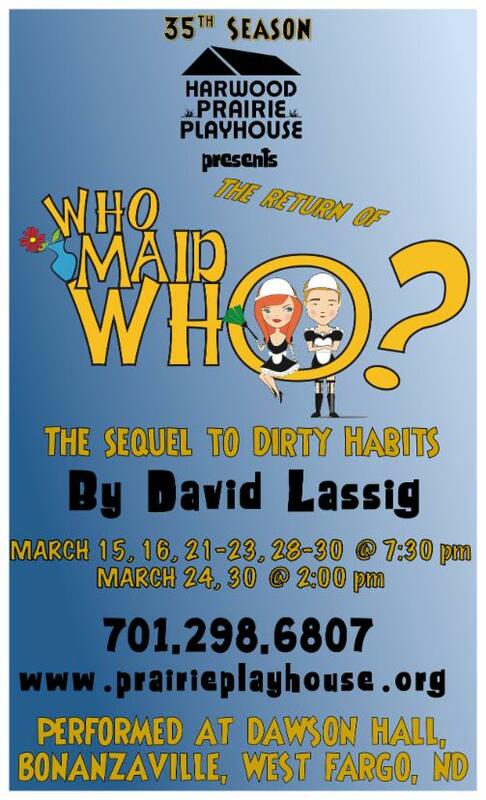 Harwood Prairie Playhouse presents it's 35th season with the production of Who Maid Who? Join us as we present the return of one of our most popular shows for it's 10-year anniversary. First produced on the HPP stage in 2009, Who Maid Who? played to sold out crowds and became the most requested show to bring back to the HPP stage. Who Maid Who? has been produced in Australia, the UK, Canada, and all over the United States. Producers of the show have compared it to the likes of a Ray Cooney farce, so this is one show you don't want to miss. In Who Maid Who?, Joe's mischievous weekend get-away with his would-be mistress at his lake cabin goes horribly wrong when his wife shows up and catches him with his new French maid. As if the situation weren't sticky enough, Joe's parents have a weekend of their own planned at the lake cabin. With an inquisitive cop, a chef, a gardener, and a variety of young and old maids, how will Joe manage to sort everything out. Online ticket sales begin February 8th at 8:00 am. Box Office ticket sales begin February 12th at 10:00 am. Once again our box office will be located at The Children's Museum at Yunker Farm - 1201 28th Ave, N, Fargo, ND, 58102. The box office phone number is 701.298.6807. Tickets may be purchased by phone or in person at the box office. Orders are also accepted via voicemail. See the Box Office page for additional ticket information. Show dates for 2019 are March 15, 16, 21-23, 28-30 at 7:30 pm and March 24 & 30 at 2:00 pm. *Special opening night reception after the show on March 15 - stay after the show for refreshments and meet the cast, crew, and director. *Veteran's Appreciation night on March 21st - tickets only $10 for all Veterans and guests, plus free popcorn for everyone! *Join us for dessert after the 2:00 pm show on March 24th - all tickets $10. *Senior citizen night is March 28 - arrive at 6:45 for treats before the show. Although anyone may attend this show, Seniors 55+ receive $5 off the regular ticket price of $15. *On Friday, March 29 we will announce our show for 2020. Get your ticket to this performance and be the first to hear about our 2020 show and win some fabulous prizes, including tickets to the 2020 show. Afterwards, enjoy refreshments and appetizers as we celebrate the announcement. If you are interested in ushering for a performance please click here to sign up online. Shows are performed at Dawson Hall, Bonanzaville in West Fargo, ND. The address is 1351 Main Avenue West.